What should you expect from us before your special day? "...They have been here for us since day one, always replied quickly to our emails, suggested good ideas and respected our budget..." / Steve Calvino Ulrich - Strasbourg, France. What should you expect from us during your wedding? "...Breathtaking, perfect, incredible, unbelievable, beautiful..... all these words do no justice to just how truly amazing my wedding was..." / Stacey Ann - Sydney, Australia. "...Absolutely amazing! They made everything so easy and nothing was too much trouble for them. We had such a fun and relaxing day and couldn't be happier..." / Sherina Ellis - Brisbane, Australia. What should you expect about our pricing? "...I love how they were very clear in the cost involved in each component and their assistance in customizing a wedding that we wanted but yet watch our budget for us..." / See Toh Wei Yann - Singapore. What should you expect your guests to say after your wedding? "...We had such an amazing time and many of our friends said it was the best wedding they have attended..." / Zhao Kuang - Tokyo, Japan. "...We just had our wedding in Bali with 40 guests came from Hong Kong Malaysia and Australia. The comments I received so far were, ‘Angie , your wedding is the best wedding I have ever attended, your wedding is so beautiful and romantic..." / Angie Ng - Canberra, Australia. Visit our Review section to view 100+ feedbacks from our brides & grooms. Visit our Portfolio section to view 2000+ weddings albums from our newlyweds. Meet the people who will organize your event. 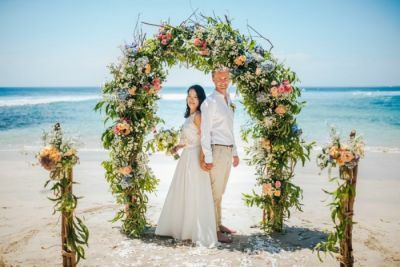 What is it that makes Bali Island a top wedding destination? Breathtaking views. Imagine getting married to the backdrop of a beautiful beach, a unique Balinese temple or having your wedding on top of an ocean cliff, at the foot of a waterfall, on the slopes of a volcano or in a lush tropical garden. In Bali, all of this and much more is possible. Bali Island surprises everyone with its beauty and diversity and the amount of amazing wedding sites with breathtaking views seems infinite. Most of these amazing wedding locations are located within an hour or so driving from the hotel or villa where you will be staying. First-class wedding venues. Most of the wedding venues in Bali are found at stunning places. From dramatic cliffs tops overlooking the ocean and secret beaches hidden away from crowds to splendid private villas and luxurious resorts. Bali has got absolutely everything for an amazing high-end, first-class wedding. It’s not only the stunning wedding venues that make Bali such a sought-after wedding destination, it is also the premium accommodation provided for the wedding couple and their guests that add such great value and above all, the island of Bali is also one of the least-expensive places in the world to have a first-class wedding to remember for a lifetime and beyond. High-level wedding professionals. The wedding industry in Bali is booming. 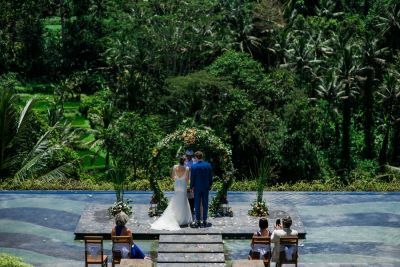 The island is home to hundreds of wedding planners, wedding photographers, caterers and so on and although there may be some exceptions to the rule, most of the wedding professionals in Bali live up to high-level international quality standards. Excellent climate. One of the biggest and most critical issues when it comes down to planning your wedding is the weather. 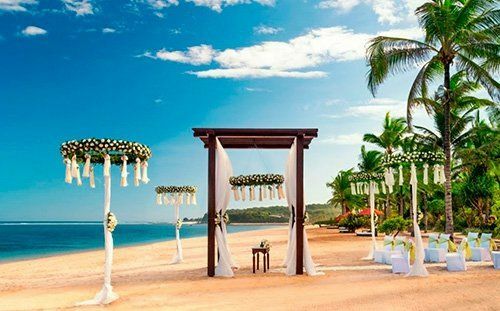 Although the best time for an outdoor wedding in Bali is in the dry season, this tropical island has got sunshine all year round, making it a perfect wedding destination at all times. Find more details below. Unique Bali people and culture. The Balinese culture is truly fascinating, the people are heartwarming with their welcoming smiles and the island is home to thousands of temples. Magic is in the air here on ‘The Island of the Gods’ and it just feels good to be here and get married on this enchanting little island in the Indonesian Archipelago. How does this connect to your future wedding ceremony? It is hard to put into words, just come and experience it for yourself. High standards of accommodation & infrastructure. It’s not just the fabulous views that put Bali on the top of the list when it comes down to wedding destinations, it is also the high-end accommodation and the well-developed infrastructure. Bali has been a popular tourist destination for decades already, resulting in hospitality standards of the highest level. We can ensure that you and your guests will be utmostly pleased with your stay here on the island. Did you know that the World Bank Meeting 2018 takes places in Nusa Dua, Bali this year? Bali is easily accessible from all over the world and the island can accommodate events like this perfectly well. It’s prestigious. Let’s be honest: there is some kind of prestige in getting married on the island of Bali. Hundreds of celebrities and thousands of ordinary couples have chosen tropical Bali as their wedding stage. We can’t argue: it is one of the most prestigious wedding locations found around the globe. Perfect honeymoon destination. After the big day, newlyweds don’t have to fly out to have their honeymoon - they already are on paradise island. There are plenty of super romantic, quality honeymoon options for Bali honeymooners from all over the world on any budget. What is the best month to plan your wedding in Bali? Although the dry season of Bali occurs between the months of April and October, many beautiful weddings take place between November and March, the so-called rainy season. Unlike other tropical destinations, Bali’s rainy season is not really heavy. Often, the rain falls at night and usually, the rain only lasts shortly, (a couple of hours maximum). 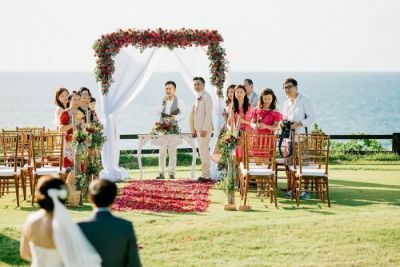 However, due to global climate change, it’s not really easy to predict what the upcoming rainy season will be like and a professional wedding planner will have a Plan B ready. A tent or a private villa with a covered area for the reception can be the solution. Some companies, including The Seven Agency, even provide Rain protection program for their clients. On a side note, getting married in the rainy season has its benefits; couples will get low-season prices for the flights and accommodation. What’s the most amazing place to have your wedding ceremony in Bali? Top wedding areas: Uluwatu, Canggu, Nusa Dua. Uluwatu offers the most expensive wedding villas in Bali. Most of them are located on top of a cliff with a million dollar ocean views. These amazing 5-star luxury villas with premium services and breathtaking views are what every bride dreams of when picturing their wedding venue. Canggu features beautiful villas surrounded by rice fields as well as oceanfront luxury villas. Nusa Dua features one long stretch of white sandy beach dotted with famous 5-star resorts such as St.Regis, Ritz Carlton, Hilton, etc. Remote wedding areas: Karangasem, Ubud, Tabanan. If you are looking for a place that is less crowded, unique and more affordable, consider one of these areas. 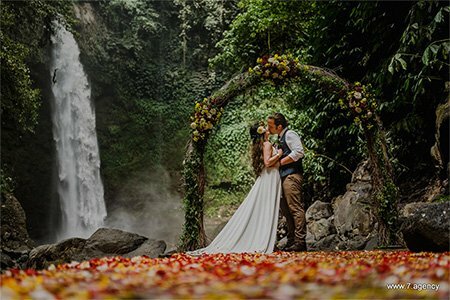 In the lush tropical valleys and rainforests around Ubud, you can get married at the foot of a waterfall. Karangasem offers some great cliffs and beautiful beaches and Tabanan has a good range of high-end private luxury villas offered at surprisingly affordable rates. Crowded wedding areas: Kuta, Seminyak, Tanjung Benoa. If you don’t care about strangers passing by while you say “Yes, I do” to your future husband or wife, welcome to popular places like Kuta, Seminyak or Tanjung Benoa. All of the beachfront venues are located on lively public beaches which can get overcrowded at times. You can also choose to have your wedding in quiet areas around the island such as Lovina, Kintamani or West Bali but these regions are not as easily-accessible and therefore, they are not famous for wedding events. What are the best wedding venues in Bali? There are hundreds of gorgeous wedding venues in Bali and the wide range of options can be overwhelming at first. Let’s divide them into the following categories: Beach weddings, Cliff weddings, Resort weddings, Chapel weddings and Villa weddings. It depends on what kind of wedding you want to have. For those of you planning a big wedding event (25+ guests). A wedding reception for more than 25 guests is best held at a private villa. Wedding villas offer many advantages over resort or chapel venues. For example, you get to enjoy ultimate privacy, you have the freedom to bring any vendor you may like, and two or more nights stay in the villa are usually already included in the price. Contact us for more details. Opting for a small elopement ceremony with no or just a few guests. Small intimate weddings can be held anywhere you like but the most popular places are on private beaches or on top of oceans cliffs. If you are looking for something more unique, go ahead and look into ‘Waterfall Weddings’ or how about having a ‘Royal Balinese Wedding’ at a sacred Hindu temple? These are just some of the possibilities. There are plenty more options to explore. Approximately how much does a wedding in Bali cost? This is a frequently asked questions but it is not easy to answer.It really depends on what kind of wedding you want to have. To get a rough idea, we made a little overview. Do note that all wedding options below are considered as a high-quality and they include all necessary components such as a wedding venue, photographer, make-up artist, basic decorations, private air-conditioned transfers for the couple, etc. Small beach or cliff weddings for the couple and a few guests: $1.500 to $3.000. Take a look at our selection of ready-to-go wedding packages to see the final prices of the packages. Big villa weddings with a reception for the couple and 25+ guests: $15.000 to $50.000 (2-nights stay in a 3-bedroom villa is included). Big private cliff wedding with a reception for the couple and 25 guests: from $5.000 to $10.000. 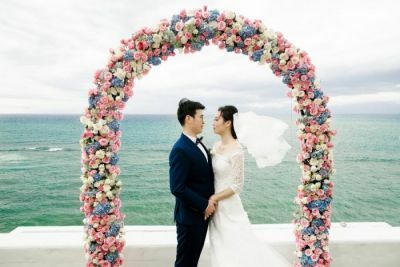 On a side note, if you are a couple looking for some super simple wedding on a public beach with only a flower arch as decoration, the price tag can be as little as $700. Feel free to ask us for more details on how much your wedding will cost. If you are want to know more about our ala-carte prices and services for your wedding, please visit our page Ala-Carte Services where you can find al up-to-date prices without hidden fees of any kind. Can I get married legally in Bali? You have to provide us with the necessary documents. The procedure of legal marriages in Bali may vary a bit, depending on your nationality and whether or not your country has a consulate or embassy in Bali or Indonesia. We strongly recommend you to contact us first and check all the details before you make any further plans. All consultations are free of charge. Should you go for the ready-made, all-inclusive wedding package or for a tailor-made wedding in Bali? For small weddings with no or only a handful of guests, the best option probably is to go with a wedding package. You can always modify the wedding package to your personal likings by adding, changing or removing pre-selected wedding items from the wedding package of your choice. Big wedding events with a wedding reception are best tailor-made by our wedding experts to the preferences and ideas of the couple engaged to be married. However, for both small and big wedding celebrations, we recommend choosing one of our wedding packages as a starting point. How many months before your wedding date should we start planning and make the booking? The answer is simple: as soon as you can! Bali is a top wedding destination for couples from all over the world and the demand for wedding venues is high. If you book late, you could be missing out on that wedding venue that you wanted and on top of that, the best vendors such as photographers and make-up artists will be fully booked as well. Especially for those couples who plan to get married on a special date such as 09-09-2019, we cannot emphasize enough that you need to make reservations asap. Makes sense, doesn’t it? Make sure to book the date and secure your wedding venue with a small deposit as early as possible. What is important to consider when selecting your wedding planner in Bali? Reviews. What do former customers have to say about the company? What are their experiences? It is important to check out the reviews of the wedding company and make sure you do this on third-party websites. The reviews on their own website may very well be fake ones. The Facebook page of the company is a good source to get authentic, unbiased reviews. All of the reviews are verified by Facebook and you can see who wrote the review or even leave a comment and start a discussion or send a friend request. The Seven Agency invites you to visit their Facebook page and have a look at their reviews. There are over 100 verified reviews from past brides and grooms. Photo and Video portfolio. A picture is worth a thousand words. The photos and video albums on the website of wedding planners tell you a whole lot about the quality and quantity of their past wedding events. Trustable wedding planners should have multiple albums with weddings held at different wedding venues. On The Seven Agency Portfolio page, you can find more than 2000 wedding albums from weddings at various venues and locations. It’s also easy to navigate by using tags to search for beach, cliff, waterfall, villa and other weddings. Legality. Your planner-candidate must be legally registered in Indonesia and they have to be in the possession of all necessary licenses. If you have any doubts, it’s better to ask them to send you their registration documents so you are sure about their legality. You don’t want to be at risk of them disappearing with your deposit payment. The chance of this happening is quite low but it has happened in the past. To be entirely safe, it is highly recommended to choose a wedding organizer from Bali Wedding Association (BWA), the only government-related wedding organization in Bali. BWA takes partial responsibility for their members, bringing peace of mind to all couples planning to get married in Bali. Real, not just online; an office is a must. Also, it is very important to check where the office location of the wedding planner is. Ask them to send you their Google maps location and real pictures of their office. Use street view mode and make sure that their office really exists on the map. There are some “wedding professionals” who put fake addresses and Google Maps links on their website. Stay away from them! Choice and transparent prices. To avoid the situation where companies can play around with the prices, it's better to choose a wedding planner that offers a choice of wedding packages with transparent prices already listed on their website. This way, you can quickly get a good idea of what kind of wedding matches your budget. Do note that the basic package is only a starting point. On The Seven Agency website, you can find transparent rates for Wedding packages and Ala-Carte Services. A company over a person. An essential point. Many wedding organizers are so-called “one woman (or man) shows.” This means that your wedding planner is just one particular person who does everything him/herself and organizes your big day with the help of freelancers. How can this one person provide true quality time when he/she has more than one client, replying to all emails, meeting clients, making arrangements and schedules? And what happens if this one person gets sick? How do they guarantee top quality if they work with freelancers who may not be trained for wedding events? 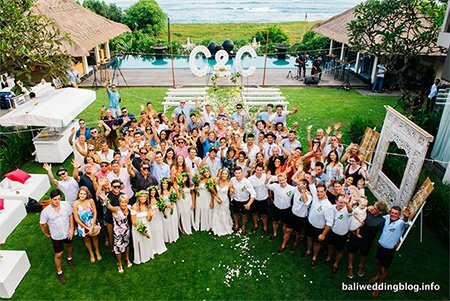 Unlike many other wedding planners or hotels, at The Seven Agency, we have a large in-house team (42 Bali-based employees and over 20 staff overseas in other countries). Find out more about The Seven Agency team here, including photos and a team video.